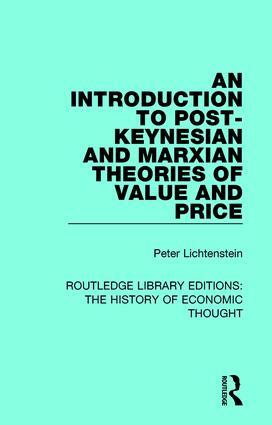 Peter M. Lichtenstein believes that any social-economic theory of capitalism must begin with a theory of value and price. Dismissing the neoclassical school, he turns to post-Keynesian and Marxian economics with their coherent and consistent theories of value and price based on concrete objective circumstances. The development of these theories in the author’s aim because he believes that this approach comes much closer than neoclassical theory to capturing the essence of a capitalism economy. This book, first published in 1983, is addressed to economics students, especially to those studying microeconomics or the history of economic thought, and to economists seeking an overview of these issues. The volumes in this set, originally published between 1925 and 1990, draw together research by leading academics in the area of the history of economic thought. The volumes encompass many different schools of economic thought, with a focus on individual economic thinkers such as Friedrich Hayek, Adam Smith and Piero Sraffa. This set will be of interest to students of economics, particularly students of the history of economic thought.